Over 50 years ago, Larry, Steve, and Rudy Gatlin started singing in their little hometown of Odessa, Texas, and from there went on to make music history. Over the course of a four-decade career that has taken the Gatlin Brothers from dusty Texas stages to White House performances, from Broadway to Grammy Awards to the top of the country charts, there has been one unifying element, music. There's no harmony quite as pure as family harmony. "Gatlin harmonies spin with high and light precision and their music bleeds and screams of love and a lot of living. Said Country Capsule in New York. Larry, Steve, and Rudy love to sing together. Raised on Gospel music, the brothers first began entertaining audiences in churches and then with guest appearances on the Slim Willet radio and TV shows in Abilene, Texas when they were 2, 4, and 6 years old. Larry says that their history as "gospel music junkies" came from those early roots. "My folks took us to those old fashioned Southern style quartet concerts, and it was love at first sound! My first hero was James Blackwood of the Blackwood Brothers Quartet-I just knew somehow from that moment that I wanted to be a singer for the rest of my life." After high school, Larry went to the University of Houston on a football scholarship. He majored in English and quickly developed "a love affair with the English language" that later served him well in his songwriting. On the strength of his song writing talents and exceptional vocal ability, his life was changed by the legendary Dottie West who saw gold just under the unpolished surface of young Gatlin. The early 70's found Steve and Rudy in college while Larry, aided by West, moved to Nashville to write songs that would be recorded by names like Johnny Cash, Kris Kristofferson, Barbara Streisand, Tom Jones, and yes, Elvis Presley. In 1972, Larry landed a solo deal with Monument Records through friend Kris Kristofferson and invited his siblings up to Nashville to sing backup on his first two albums?1974's The Pilgrim and 1975's Rain Rainbow. The release of The Pilgrim landed Gatlin his first hit with "Sweet Becky Walker," and then found himself at #1 on the charts the next year with "Broken Lady," a song that captured him a Grammy in 76'. The same year all three brothers were inducted into the Grand Ole Opry. 1977's High Time, credited to "Larry Gatlin with Brothers and Friends," featured the No.1 hit "I Just Wish You Were Someone I Love." The success of this album encouraged the brothers to become an official trio and in 1979, they signed a group deal with Columbia records. When demand from hit records sent them on the road, The Gatlin Brothers proved more than capable of fulfilling the musical call on their lives. In concert, their performances were simply magical events, filled with incredible family harmonies, total professionalism, and downright fun for both the trio and their audiences. Over the next decade the Brothers scored more than a dozen Top 40 hits, including "Denver," "Houston (Mean That I'm One Day Closer To You)," Midnight Choir (Mogen David)," and "She Used To Be Somebody's Baby," "I Don't Want To Cry," "Statues Without Hearts," "What Are We Doing Lonesome," I've Done Enough Dyin' Today," "Take Me To Your Lovin' Place," "Night Time Magic," "Love Is Just A Game," "The Lady Takes The Cowboy Every Time," and Talkin' To The Moon." It was also in 79' that Larry Gatlin won the ACM's "Top Male Vocalist," Straight Ahead won "Album of the Year," and "All The Gold In California" won "Single of the Year." Throughout the 70's and 80's, the Gatlin Brothers lit up major marquees and packed concert halls across America. Then, in 1992 after much soul searching and prayer, the brothers made a decision to stop touring. They ended with "The Adios Tour" along with an accompanying album release of the same name, and it gave the boys a chance to say goodbye to their fans and for the fans to say goodbye to the Gatlin Brothers. Explains Larry, "We just thought our time in the spotlight was probably over. We had a great run and are thankful for it. We felt it was someone else's turn in the spot light." As Larry says, "You know what Bob Dylan said...things they are a changin'." According to Larry, a promoter in Dover, Delaware "made us an offer we couldn't understand...so we took it! Since then a popular ground swell, maybe not a large popular ground swell, but a ground swell nonetheless, has arisen that has persuaded us to do some selected dates that we are calling 'The Gatlin Brothers Never Ending Reunion Tour." Visit www.gatlinbrothers.com for a list of performances across the country! At this stage, the Gatlins' have the best of both worlds, families and fans, plenty of work both as individuals and together. "A long time ago we decided to make music for our fans and people who came to our shows," says Larry, "and I know that Steve, Rudy, and Larry are going to stand up and sing in tune every night." And during the day, play as much golf as possible. Larry Gatlin (born May 2, 1948 in Seminole, Texas) is an American country music singer. He is best-known for teaming up with his brothers in the late 1970s, where they became one of Country music's most successful acts of the 1970s and 1980s. Gatlin has a total of 33 top 40 singles under his belt, inlcuding both his solo recordings and those with his brothers. As their fame grew, the band became known as Larry Gatlin & the Gatlin Brothers. Their popularity lasted throughout much of the 1980s. Their biggest hits together included, "Broken Lady", "All the Gold In California", "Houston (Means I'm One Day Closer to You)", "She Used to Be Somebody's Baby", and "Talkin' to the Moon". Larry Gatlin is known for his rich tenor voice. Larry Gatlin is known for the string of pop-inflected hit songs he recorded during the 1970s and 80s. During this time, country music trended heavily towards polished pop music arrangements in a style that came to be known as Countrypolitan. Larry Gatlin and the Gatlin Brothers came to prominence and enjoyed their greatest success during this period. Gatlin was born in Seminole, Texas in 1948. He was raised listening to Country and Gospel music. Even since childhood, he and his brothers, Steve and Rudy have always sung and performed together. When they were younger, they often sang in their local church. They sometimes performed on local radio stations, and occasionally on television shows. They also recorded a Gospel music album for the Gospel label Sword and Shield. After graduating from Odessa High School in 1966, Gatlin attended college at the University of Houston. A wide receiver on the football team, he caught a touchdown pass in a game in which the University of Houston scored 100 points. He later was auditioning to join a Gospel music group called the Imperials. "The Imperials" went on to perform in Las Vegas, Nevada in January 1971 at Jimmy Dean's Las Vegas Revue. While walking through the showroom, he caught legendary country singer Dottie West's attention when she thought he looked like Mickey Newbury. With West's help, Gatlin found work in Nashville as a background singer for Kris Kristofferson. In 1973, Gatlin finally landed a solo recording contract with Monument Records. In 1973, Gatlin released his first album, entitled The Pilgrim. Two singles were released from the album: "Sweet Becky Walker" and "Bitter They Are, Harder They Fall"; however, both singles failed. A year later came the release of a new album (Rain/Rainbow) and a new song ("Delta Dirt"). The album and single proved more successful. "Delta Dirt" was a Top 20 Country hit, peaking at #14. The song was also Gatlin's only entry on the Pop charts, when it reached #84. In 1975, Gatlin had his first major hit with his own composition entitled "Broken Lady", which reached #5 on the Hot Country Songs chart in 1976. The song was so successful; Gatlin won a Grammy award for the song in 1977 for Best Country Song. A new album was released in 1976 entitled High Time. The Gatlin Brothers made their first appearance on Larry's 1976 album Larry Gatlin with Family & Friends. hey were featured on some of Gatlin's other hits he had during the late 70s, notably "I Don't Wanna Cry", "Love Is Just a Game", and "Statues Without Hearts". In 1978, Gatlin gained his first number 1 with "I Just Wish You Were Someone I Loved." Gatlin continued his music success as a solo act up until 1978, when he released his last solo album, titled Oh Brother, which featured the Top 10 hits "I've Done Enough Dyin' Today" and "Night Time Magic". Soon it became quite obvious that his brothers wanted to become country performers as well, and Gatlin decided to have his brothers as part of his band. In 1979, when he signed with Columbia Records, Gatlin decided to officially have his brothers billed on his singles and on his albums. That year, their name was officially re-titled Larry Gatlin & the Gatlin Brothers. They soon released an album in 1979 entitled Straight Ahead. It spawned a single entitled "All the Gold In California," which became one of their biggest hits together, taking the #1 spot on the Hot Country Songs list. This was Larry Gatlin's second No. 1, and led to his being awarded "Top Male Vocalist of the Year" by the Academy of Country Music that year. The group's next big hit came in early 1980, with "Take Me To Your Lovin' Place," which peaked at #5 in 1981; they followed up with "What Are We Doin' Lonesome," which peaked at #4 later in the year. They continued their hit success, garnering Top 10 and Top 20 hits, with "In Like With Each Other" (1982), "She Used to Sing on Sunday" (1982), "Sure Feels Like Love" (1982), and "Almost Called Her Baby By Mistake" (1983). In 1983, the group had their third (and last) No. 1 hit, entitled "Houston (Means I'm One Day Closer to You)". Even though the group never achieved another #1 hit, they had hits that came close, like the jaunty release in 1986, "She Used to Be Somebody's Baby" (which peaked at #2) and 1987's "Talkin' to the Moon" (which peaked at #4, as well as 1988's "Love of a Lifetime" (which peaked at #4). They were also one of the first Country groups to have music videos, like 1984's "The Lady Takes the Cowboy Every Time". In 1985, Gatlin wrote the song "Indian Summer" with Barry Gibb, which he recorded as a duet with Roy Orbison. They stayed in the Top 10 continuously throughout much of the 80s, with hits like "Denver." At points in his career, Gatlin's success got to him, after outselling concert tickets and television appearances. The pressure took a toll on Gatlin. This led Gatlin into drugs and alcohol. However, soon enough, Gatlin was sober with the help of his family and religion. When the "New Traditional" country singers entered Nashville in 1986 with singers like Dwight Yoakam and Randy Travis pushing Gatlin and other Country-Pop-styled vocalists off the Top 10 list, Gatlin's success declined greatly. He had a duet recording in 1987 with another Country-Pop styled vocalist, Janie Fricke. However, their duet only reached #21. He briefly signed with Universal Records in 1989, where he recorded his last singles. His last charted single came in 1989, called "Number One Heartache Place". After more than a decade of singing together, in December 1992, the Gatlin Brothers embarked on a farewell tour before retiring to their own theater in Myrtle Beach, South Carolina. Larry Gatlin went on to star in the Broadway production of The Will Rogers Follies. In 1994, Gatlin and his brothers opened a 2,000-seat theater in Myrtle Beach. In 1995, he played himself in the TV-movie about Dottie West's life entitled Big Dreams & Broken Hearts: The Dottie West Story. West had died four years before in a major car accident. Larry Gatlin wrote a memoir called All the Gold in California that was published in 1998. In 1999 Larry toured and entertained troops of the 1st CAV division in Bosnia. 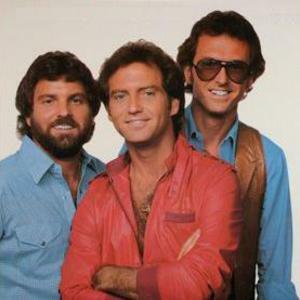 The Gatlin Brothers are the subject of a well-known country-music inside joke: it is sometimes claimed they are the collective nemesis of Kenny Rogers in his hit song "Coward of the County". However, in the movie inspired by this song, the brothers' names are "Jimmy, Paul and Luke Gatlin." (The Gatlins toured with Rogers as a support act on his 1980 tour). In the 1990s, Larry Gatlin built his own entertainment career in Branson, Missouri. AAll the singles from this point on are credited to Larry Gatlin & the Gatlin Brothers. B All the albums from this point on are credited to Larry Gatlin & the Gatlin Brothers. Wood, Gerry. (1998). "The Gatlin Brothers". In The Encyclopedia of Country Music. Paul Kingsbury, Editor. New York: Oxford University Press. pp. 195-6.